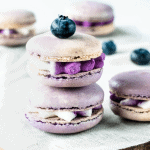 Blueberry Macarons coming at you! 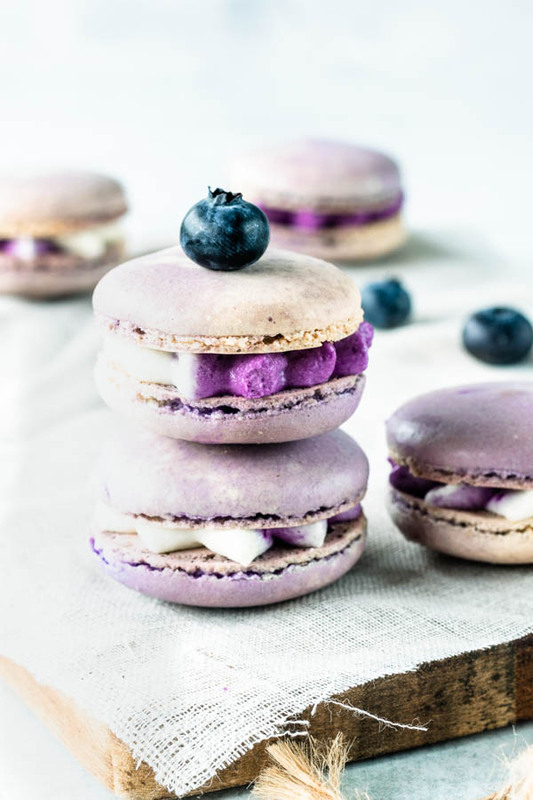 These Blueberry Macarons feature a Blueberry Mascarpone Filling, that is to die for. If you are a mascarpone cheese lover like myself, you will also love this filling! The Blueberry Mascarpone Filling is light, slightly sweet, but not too much. 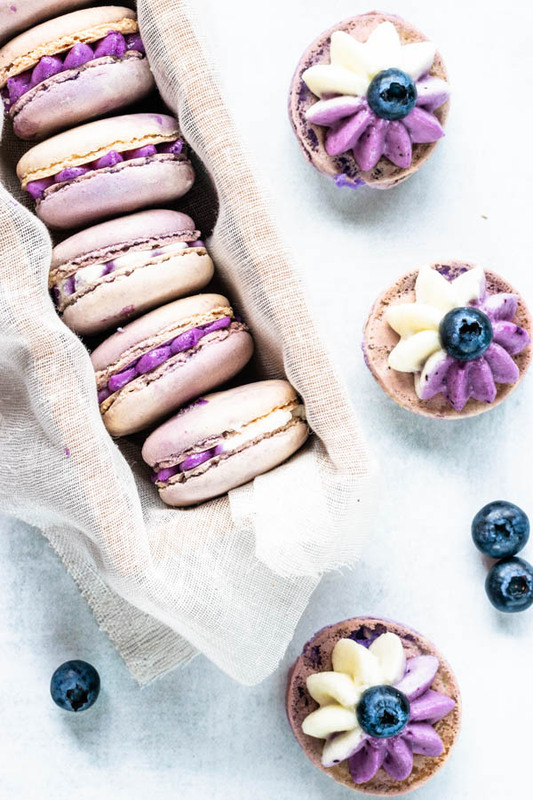 These Blueberry Macarons are perfect if you don’t like really sweet desserts, but still enjoy a treat sometimes. Two bites. The delicate texture of the macaron shells will melt in your mouth. Seriously, French Macarons are the best or what? I love Macarons. They are some of my favorite bakes. Making French Macarons can be quite tricky. Some people avoid it like the plague. But nothing that a lot of practice won’t solve. That’s all there is to it. Practice. Also, I firmly believe that not all recipes will work for everyone. And not all methods will work for everyone. 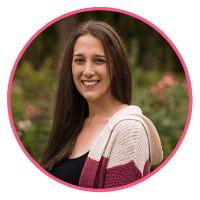 I’ve made macarons before using recipes called “foolproof macaron recipes” that didn’t work for me. And, of course, whoever published that recipe wasn’t lying about it being foolproof for them. The recipe just didn’t work for me. Just like my method might not work for someone out there. Recipes are really personal. That’s why I always feel the need to develop my own twist in each recipe. Because I follow my intuition, and that leads into amazing adventures (and sometimes disasters). Whether they work or not, nothing is wasted. The learning is the most important thing I get from each recipe I develop. And that’s where my passion for writing recipes comes from. Cooking allows me to just be creative and think outside of the box, in a safe space, where it’s awesome when I win, but also worth it doing when I lose. 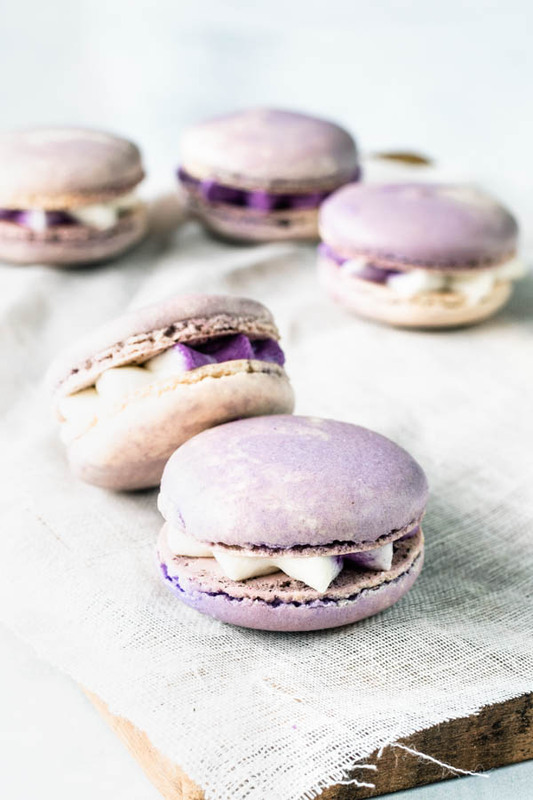 So, if you want to know how to make perfect French Macarons, I suggest doing your homework, reading about it, watching videos, and most importantly, getting to work. Even to this day, sometimes I will make a batch that won’t work, won’t develop feet, or will crack. By this point, I know my oven pretty well, and I know how the batter should look and feel like, so I don’t make as many mistakes. I hope you liked my Blueberry Macarons! I have some really useful tips on how to make Macarons in my Matcha Macarons post, but also, check my recipe below, it’s very detailed and explains each step very well. Hope you like it! If you want to check out other macarons, please click here. 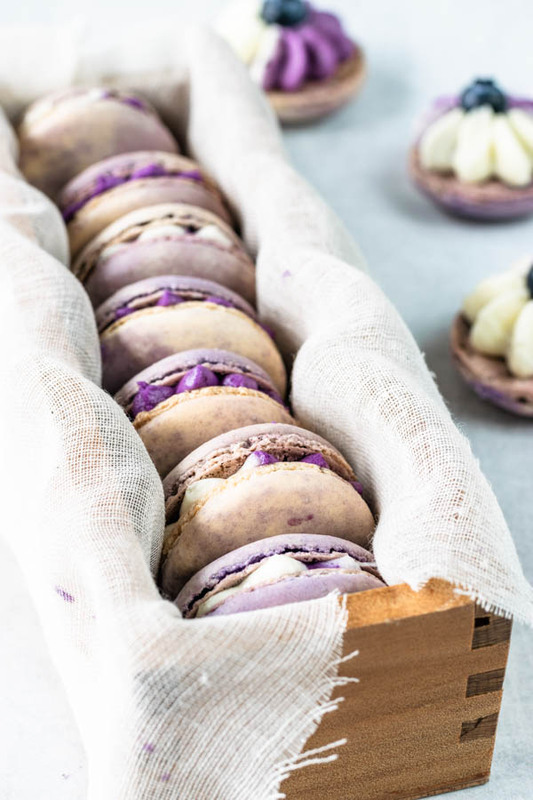 THESE are the French Macaron Recipes that are trending on the blog right now: Salted Caramel Macarons and Lemon Macarons. I also used a Ateco 829 Pastry Tip to pipe the filling in the macarons, listed bellow. 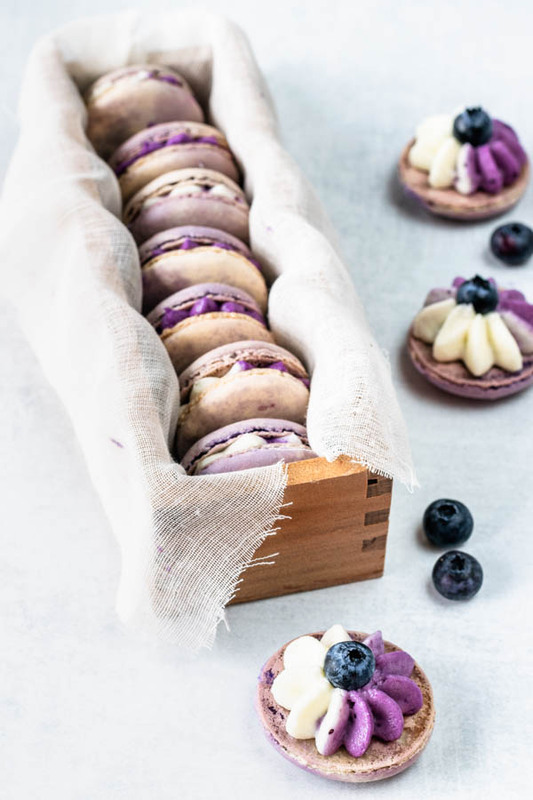 Blueberry Macarons filled with a Blueberry Mascarpone filling. Delicate shells, complimented by the sweet and creamy filling. Start by making the jam. Mix blueberries and maple syrup in a small saucepan. You can add a squeeze of lemon to it if you want to. Bring to a gentle boil, stirring frequently. Let it simmer, over medium heat, for about 5 minutes. You can use the back of the spoon to burst the blueberries. Mix the cornstarch and water in a small bowl. Pour over simmering blueberry mixture. Bring back to a boil. Let it boil for a couple of minutes. Once thickened, turn the heat off. Pour mixture through a fine mesh sieve. Stir with a spoon, pressing down on the mixture to extract all the liquid from it. Place strained jam in the fridge until completely cooled down. To make the Mascarpone filling, make sure that blueberry jam has cooled down all the way. Place mascarpone cheese and powdered sugar in the bowl of an electric mixer. Beat with the electric mixer for a few seconds until incorporated. Add vanilla. Mix until combined. Don't overmix because you will cause the frosting to separate. In a separate bowl, whip cream until stiff peaks form, 2-3 minutes on medium high speed. Fold whipped cream and mascarpone mixture together. I separated my Mascarpone Filling into two different bowls, because I wanted to do a bicolor filling. In one of the bowls, I added the jam and mixed until combined. If the mixture is too runny, you might want to add a couple more tablespoons of powdered sugar to help it firm up. Pipe a dollop of mixture on the macaron, place another macaron on top. Refrigerate macarons overnight before serving for best results. 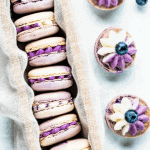 STORAGE: Macarons will store well in the fridge for up to 4-5 days. They will also keep beautifully in the freezer for up to 2 months. You might have more blueberry jam than needed for the recipe, since we only use a little bit. Just use the rest of the jam for toasts or biscuits, or to top your oatmeal or yogurt bowl. If you have any leftover Mascarpone Filling, you can store it in the freezer, in a sealed container or bag, for up to 2 months. Let it come to room temperature and rewhip gently before using it again. Oooh macarons have been on my must buy list for a long time. But I’ve always been so intimidated by them! I mean they’re SO pretty – there’s no way I could make them that pretty! Yours are sooo perfect. I LOVE the color. You could definitely make perfect and pretty macarons, friend!! Thank you so much! These macarons are simply beautiful. I can just taste the blueberries in them. Thank you Jere!! I really love these blueberry macarons! One of my favorite flavors! These simply could not be any prettier! I want one! These macarons are beautiful! I love to eat them, but cannot bake them – you’ve done it perfectly! Delicious! 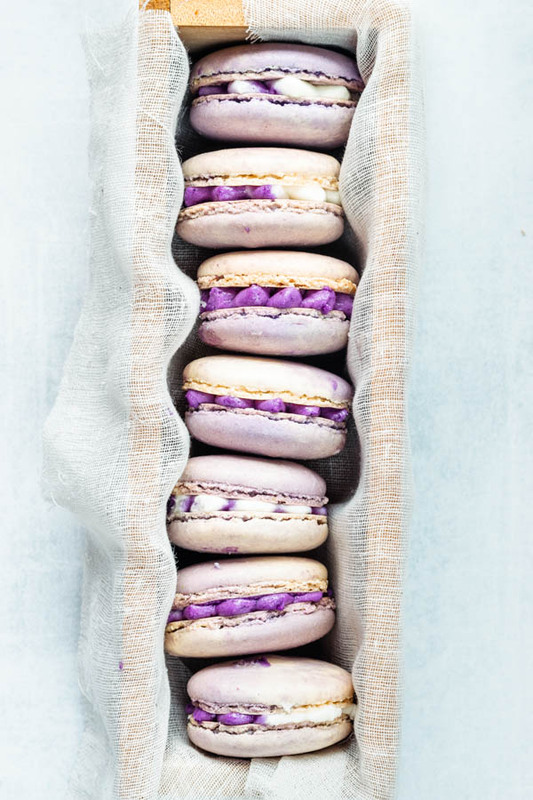 These macarons look absolutely perfect! 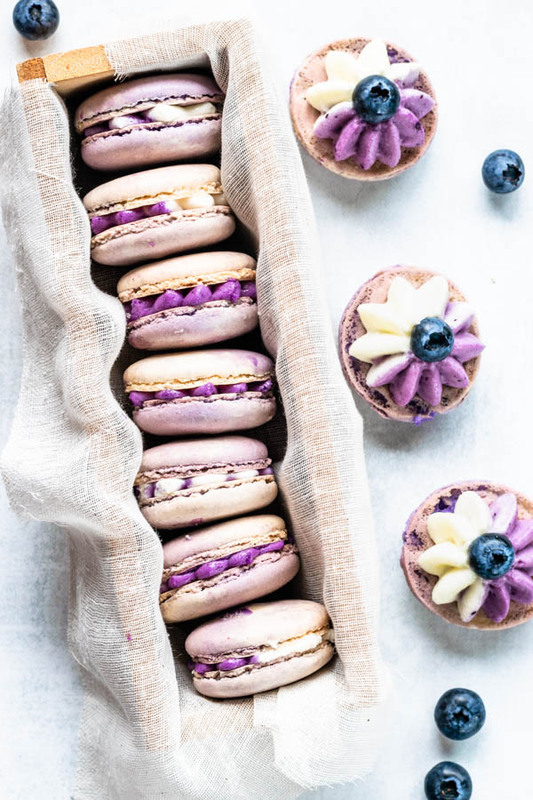 I love blueberries and never thought of making blueberry macarons – so pretty! DEFINITELY going to give these a shot! They are straight up gorgeous! Oh my gosh your macaroons look amazing. I’m totally dying to try them especially since they are blueberry flavored. These are stunning! It’s amazing that you can make such a special dessert at home. Those are gorgeous and I love the pretty piping! Very smart to use blueberry jam too. These are the most beautiful macarons I think I’ve ever seen!